The publishing community has been acutely aware of websites that produce what journalists consider “fake news” for at least 18 months now. That hasn’t at all changed what the Facebook community thinks of these websites. As was the case a year ago, the most clicked on, commented on, shared and looked at “news stories” on Facebook came from websites that had little to do with producing new information. For the sake of sanity, I will use “produces new information” as the anchor to define what constitutes “real news” in this article. Data collected over the past three months, however, shows that whatever exactly did change didn’t stop news outlets from reaching larger audiences on Facebook. NewsWhip, an application that journalists use to measure online content and discover trending stories, published a list of the top 25 bylines by Facebook engagement. Can you guess how many worked as journalists at “real news” outlets? For those unfamiliar with some or all of the news sources in the top 25 list, here’s a breakdown. Washington Press — Formerly Occupy Democrats. Rewrites news stories to appeal to Democratic sensibilities and themes. Does not produce new information. Daily Wire — The conservative version of Washington Press. Truth Examiner — Like The Washington Press, except the only thing they seem to write about is Donald Trump. The LAD Bible — A clickbait engine. Recent top stories include “Woman Pops Giant Cyst on Uncle’s Neck” and “Ancient British Law Means It’s Illegal To Be Drunk In A Pub”. Terri Peters, TODAY — Today online writer Terri Peters focuses on family topics like cats and kids. Also known to dabble in news parodies. AWR Hawkins, Breitbart — AWR Hawkins is a columnist writing whatever he wants about guns for the conservative news website (which is slightly more proactive than Daily Wire and Washington Press, but engage in many of the same content strategies. Ed Mazza, HuffPost — Ed is the overnight editor for HuffPost, meaning he writes mostly about anything Donald Trump tweets before everyone else shows up at work. Your Newswire — A trending and viral “news” source so pervasive it has it’s own thread on fact checking website Snopes. The most common associated tag is “fake news”. Dennis Pillion, AL.com — Incredibly, one of Advance Digital’s actual reporters (this is the national media conglomerate I spent much of my career with) made it into this list. Perhaps the exception that proves the rule. Dennis reports on environmental issues in Alabama. Steve Benen, MSNBC — Steve curates commentator Rachel Maddow’s page on MSNBC.com. Most of the headlines are about things Donald Trump said. Caleb Parke, Fox News — Caleb is associate editor on FoxNews.com covering Christianity and related issues. Somewhat of an underserved beat serving an overwhelmingly large audience. Many of his articles follow the theme _______(a Christian) was kicked out of _________ by liberals for saying __________. Andy Borowitz, The New Yorker — Andy is The New Yorker’s political parody author. Perhaps the master of all fake news, writing for one of the most intensive news publications out there. And there you have it. 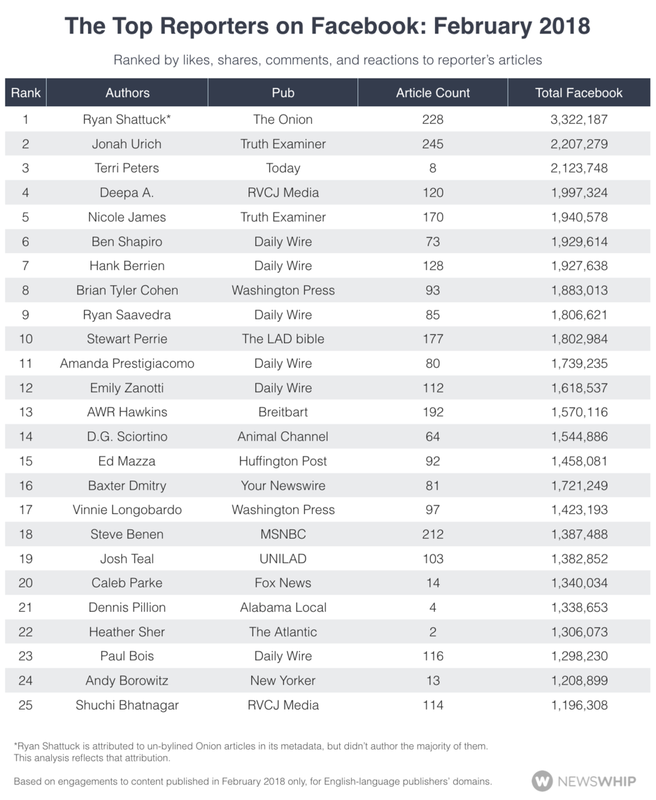 Of the top 25 most engaged (liked, shared, commented on) writers, four are journalists who actually works to deliver new information to the world, and two of those rely mostly on Donald Trump’s tweets to propel them into the stratosphere of Facebook likes. Per another NewsWhip analysis, Facebook’s claims about its recent algorithm algorithm changes, that the changes are designed to demote news content in favor of friends and family, also appear somewhat hollow. 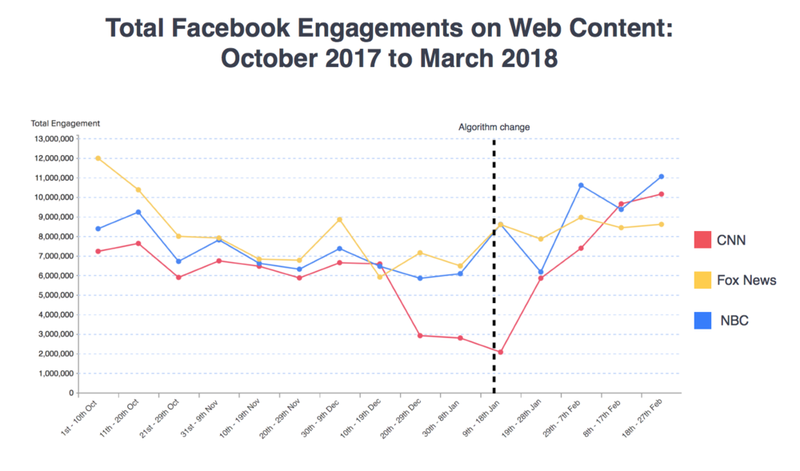 This analysis found that CNN, Fox News and NBC have all enjoyed significant engagement growth in Facebook posts since the algorithm change in early January. CNN basically came back from the dead in three months after the most recent algorithm change, while competitors Fox News and CNN have all seen improved metrics on their Facebook posts. From these two charts, two things appear true. One, fake news purveyors are having no problem dominating the audience on Facebook. Two, professional news outlets, regardless of what you may think about their content, are also having no problem growing their audience on Facebook. This isn’t the first time Facebook has made deceptive statements about demoting news content in favor of friends and family posts. The social network said almost the exact same thing in June, 2016. That was right before Fake News content exploded across the platform, as evidenced by this BuzzSumo analysis of Facebook engagement for “fake” and “real” news sources leading up to Donald Trump’s election as president. Perhaps Facebook is saying one thing and doing another, or maybe the network’s algorithm adjustments simply aren’t as predictable as executives and engineers portray. The platform is built to show users what they like. If users like silly and fake content, Facebook brass might not only be loathe to throttle it back, but may actually be somewhat helpless to users’ algorithmically-amplified desires. Of course many online “news” websites were eager to forecast the doomsday of Facebook-driven news sites. Just four days before this NewsWhip analysis came out, Ad Week, the content and marketing bible, published a survival guide for news websites trying to overcome this supposedly catastrophic shift in algorithms. Reporters taking corporations and public figures at their word — without so much as a scintilla of skepticism or verification — may be the most omniscient source of fake news out there. John Harper is co-founder and CEO at Grapple, working to build more prescient news algorithms for a more transparent online news future.